Everything old is new again! One of Replogle’s most popular styles in the 1940s and 1950s with today’s cartography! A beautiful satin chrome painted base with gyro-matic mounting complement the striking black ocean design. 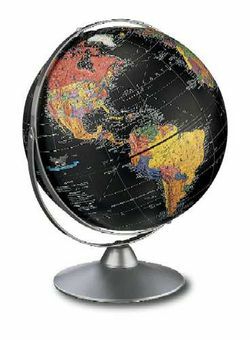 Vibrant pop art colors distinguish boundaries on the 12" diameter raised-relief globe ball. A distinctive, non-traditional choice for today’s retro trend-setters.